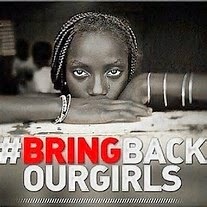 Feeling overwhelmed with emotion and sadness for the Nigerian girls and their families. As Mother's Day approaches, if your daughter is safe, be grateful. Do not let these girls leave your thoughts. I am trying to imagine them as safe and at home with their families and will support any efforts to get them there. I could not get in touch with my son for just two hours yesterday and was about to lose my mind (my 12 year-old) These 12 year-old daughters are at risk of being sold or worse. They are at risk for the unimaginable. All I know to do is sign a petition at Change.org, so I did, and I have tweeted with the #BringBackOurGirls. I haven't called my Senator or Congressman, so I will do that today. And now I sit in my freedom and I pray for their strength, their resolve, their souls, their lives. These girls and their families do not have what we have-choices, education, opportunity. Is there a greater global crisis than this that is going seemingly unnoticed? How are we not doing more? If you know of other ways to help, could you share them?